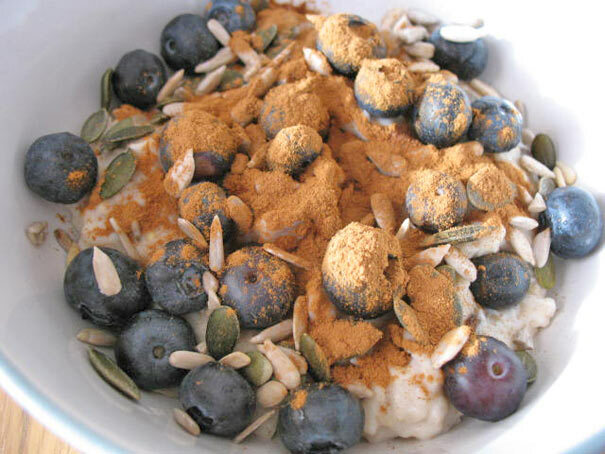 Healthy Porridge with Seeds and Blueberries - Really Good For You! 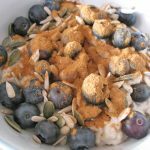 This healthy porridge with seeds and blueberries is one of my favourite breakfasts and I normally eat it at the weekends when I have enough time to cook it without rushing around. It doesn’t take long to make, only around 5 minutes or so, depending on the type of oats you use as different brands may suggest different cooking times. Adding seeds to your porridge (pumpkin seeds and sunflower seeds) is great because you are essentially adding important minerals such as magnesium, zinc and iron. Just try to soak your seeds overnight to reduce the amount phytic acid they contain. Phytic acid can actually block the absorption of minerals by binding to them so you should always try and soak your seeds (or nuts). 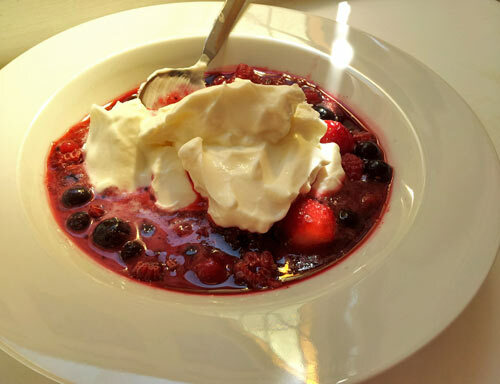 When you add blueberries to your porridge you make it even healthier as blueberries are high in antioxidants and high in vitamin C. They are low in calories so they are perfect if you are watching your weight. If you are sensitive to gluten you can choose oats suitable for gluten-free diets such as the ones from Wholefood Earth. Using organic ingredients is not a must but it’s better for you as you won’t consume any pesticides then. You can vary your porridge by using different types of fruits, such as raspberries, strawberries, grated apple, banana, etc. Use whatever fruits you like. Adding seeds helps with your daily intake of zinc and adding yoghurt will add more protein to the meal, helping you feel fuller for longer. 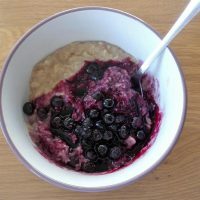 This healthy porridge with seeds and blueberries is packed with minerals and vitamins and really good for you so do try and make it at least once a week if not more often if you can. Add oats to a medium saucepan and combine with coconut milk. Bring to the boil and reduce the heat, stirring regularly and not allowing to stick. Stir constantly for about 5 mins and add more liquid (water or coconut milk) if it's getting too thick. Mix raisins into the porridge and then place in a bowl. Add a serving of blueberries and sunflower and pumpkin seeds. You can use skimmed organic milk or water instead of coconut milk. Add more or less milk to reach the desired thickness. Add a spoon or two of low-fat Greek yogurt for extra protein and calcium. Add a spoon of milled organic flaxseeds for extra fibre, iron and omega 3 fatty acids.